Spelling variations: Rockwell, Rokelle, Rockewell, Rokele, Rokewell and others. First found in Essex where they were seated from very early times and were granted lands by Duke William of Normandy, their liege Lord, for their distinguished assistance at the Battle of Hastings in 1066 A.D. Some of the first settlers of this name or some of its variants were: William, Susannah, Ruth and John Rockwell settled in Nantasket in 1630; Thomas Rockwell settled in Virginia in 1637 along with Mary; Edward Rockwell arrived in San Francisco in 1850. 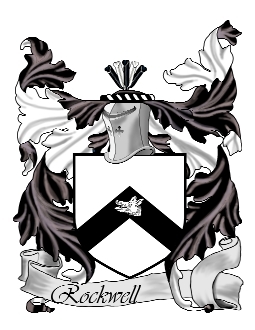 Arms: (top) Per fess sable and argent, on chief three argent boar's heads, on base sable cross patee. 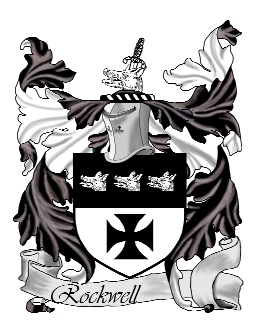 Motto (another): "Totus pro meus Deus quod rex rgis"